Most of my friends and relatives like my Fenugreek Chicken curry. I am not a big fan of chicken but I don’t mind a good chicken gravy to go along with crusty French loaf. This time around I decided to share my Fenugreek Chicken recipe with a built in pastry that you can eat the curry with! 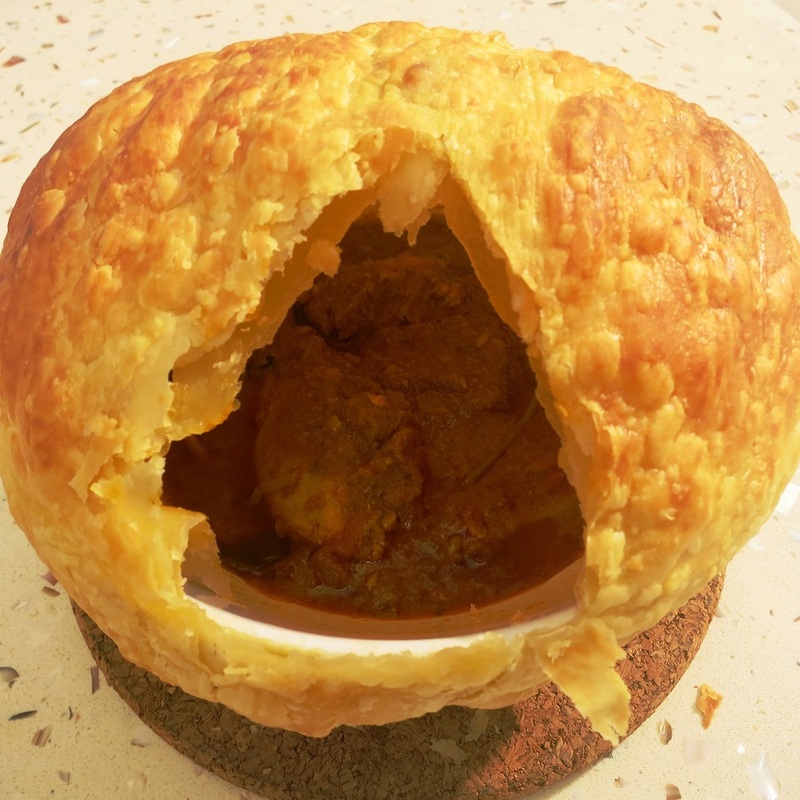 I am sure you will like this rich herbal chicken curry with the crisp golden dome made of sheets of puff pastry bought from the supermarket. Put chicken pieces into a bowl. Add in the yoghurt and salt and mix it well. Leave aside to marinate for 1/2 hour. Put onion, garlic cloves, ginger, chillies and 100 g water into a blender and blend coarsely. Keep aside. Heat Q.B.B. ghee and fry the cinnamon, cardamoms, cloves, bay leaves and mace until aromatic. Add in the chopped ingredients and sauté till lightly browned. Add in the marinated chicken pieces, tomatoes, turmeric, coriander, chilli powder, salt and remaining water. Mix well and cook covered, over gentle fire till the chicken is half cooked. Add in the julienned ginger strips, drained soaked fenugreek and the coriander leaves. Stir to mix well, cover and simmer the curry until the chicken is tender. Dish out the curry into small serving sized oven proof bowls. Cut puff pastry and cover the bowls. Place in a hot oven and bake at 200°C for 20 minutes or until golden brown.